Virtex Edge Design is coming out with Metric Racer later this year, a Wipeout-esc racer in the style of Borderlands. To expand the replayablility, feature set and appeal of the game though, we’re shipping it with the Level Editor allowing for players to create, edit and share their own tracks. The tracks are made up of editable sections encompassing of straights, curves and ramps, all with 0-45 degree banks and bends. Each of the sections types though required creating a specific model for each section type for each Location theme type (Earth, Mars, Titan etc…) along with a physics mesh representation for collision management. One set of Curves for One Theme. It became evident really quickly that this required a lot of modeling time and wasn’t the best course of action. The modeling was essentially performing the same actions again and again; Extrude a section across a curve in blender, rotating the end by a certain percentage for banking, and then apply a UV texture from there, and then repeat the process for each new set of track sections each time a new theme was added. Additionally, the physics mesh took a lot of fine tuning to get right so ships would stay on the track and not fly off or skip on section transition points. Each time there was a change, it required updating all of the models which shared that type. Since the modeling process was a repetitive and predictable process, and to help speed up development of Metric Racer, we developed a Mesh Generator for generating track sections. The Tracks are generated and extruded from a single ‘Mesh Seed’, a 40×40 unit Model which holds the repeatable data for the track sections. The system then extrudes out the Mesh Seed, rotating twisting and modifying along it’s extruded path as needed. This allowed for tighter control of how the meshes lined up and behaved, as well as allowed for more rapid prototyping and testing, and since each different planet has a different track theme, it cut down on modeling time significantly. Below I’ve gone over how we went about rotating and manipulating each vertices when generating the track. To extrude a straight portion is a relatively simple method. 1) First we must get the vertices point about origin. This is done simply by taking out the ‘z’ component of the vertices. 3) Next we want to position the ‘rotated’ vertices to the extrude position along the ‘z’ axis as well as find the percentage we’ve gone along the extrusion. If the mesh seed is 40 units long, and we want to extrude it 200 units, then we simply recreate the mesh 5 times, factoring all of the ‘z’ values for each ‘section’. 4) Finally we set the vertices position back into the Vertex Array. Extruding along a curve is slightly more involved. We do the same of rotating the point at the origin, and then translating it to the ‘extruded’ position. 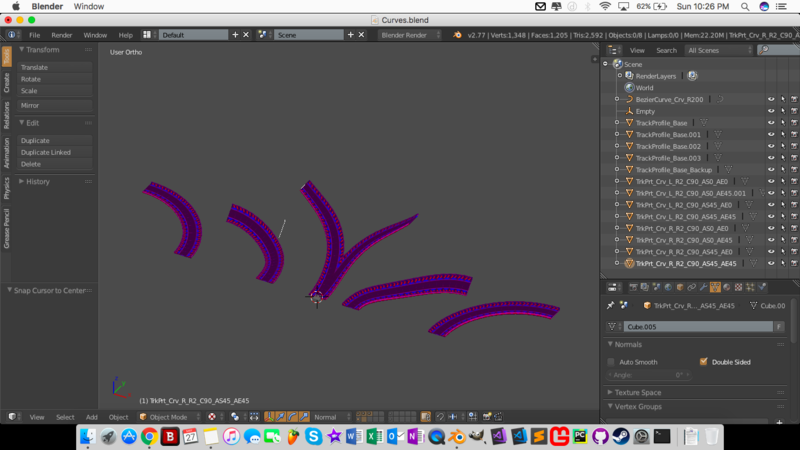 It’s finding the ‘extruded’ position and rotated amount along the curve which adds a few more steps to this method. 1) Get Vertices Point about the Origin and calculate the percentage along the curve. Again, this is done simply by taking out the ‘z’ component of the vertices. To get the percentage along the curve, we use this. 2) Perform the Required Rotations on the Point about the Origin. We’re only going to rotate it by 45 degrees by the end, so we need to rotate it here. Since 'y' is considered up, we now need to use trig to translate the point in x & z. 4) Finally, Set the Final Position. Since we’ve only really calculated delta’s here, we need to translate the original position of that point along the circumference. When we calculate the new position data, we only need to apply the new rotation transfroms to the normal, binormal and tangential data since it’s all relative to the models original orientation and not it’s position in space. Immediately after implementing this, the pay off was evident. 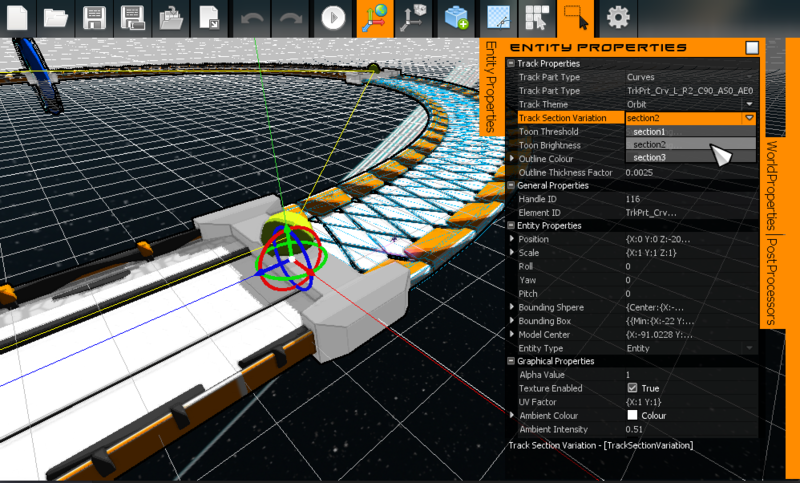 We were able to add a number of new track section types within a couple of minutes instead of having to spend an hour to create completely different themes and physics models. 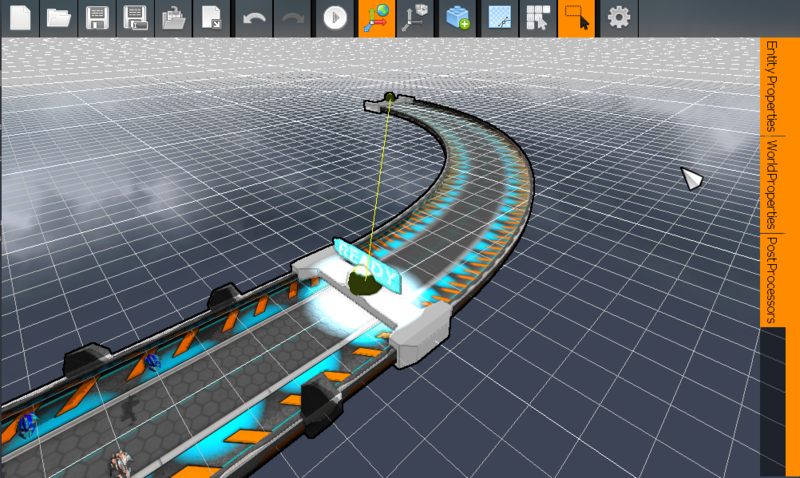 Further to this, we could modify the track width simply by modifying some of the extraction code. When extruding the mesh, we could check if any point was past the wall distance and then add on an extra distance to make the track wider. It also allowed us to fine tune the physics model; and since all of the extrusions were mathematically based, instead of modeling based, the meshes matched up perfectly without having to painstakingly check each model for each theme. To add variation to each theme, we’ve started adding different section variations for each theme, so that a certain stretch of track could be the basic type where another could have no walls, and another have a grating for the center portion. Further to this and to aid in track manipulation, I’ve added ‘editing’ nodes, which are the lime green balls you see in the above gif; these allow the player to customise the track layout even further. Automating the track generation has been instrumental in Metric Racer’s development and has allowed for track and level generation to speed up 10 fold and with an entire new level of quality. That’s all for this week. We’ll have another development post next week, Give us a follow here or on twitter and a like on facebook to keep up with everything we’re going! 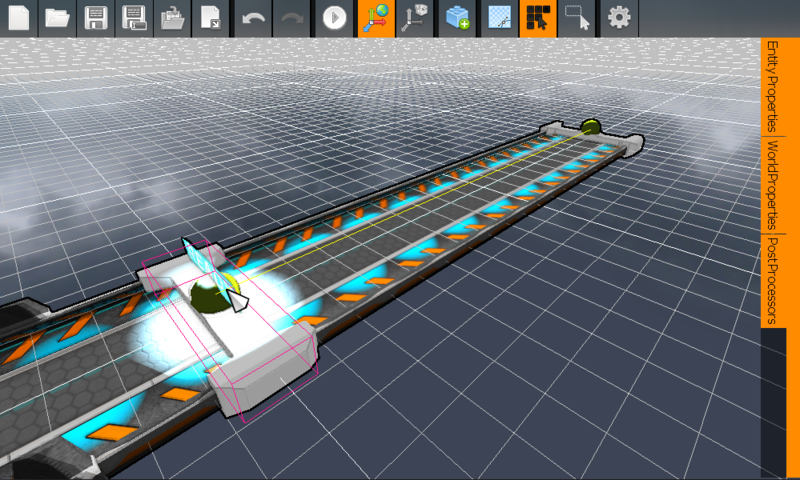 To help speed up the development of Metric Racer, I developed a Mesh Generation System which generates entire tracks from template seed meshes. Check out below over at Virtex’s main site for how I implemented it.